After a surgery or medical procedure, we are given medications and recovery plans. We are told how often to take those medications, when and how to eat, what our physical limitations will be. As someone who likes to have lists and know what comes next, I appreciate these instructions. I’m learning, however, that even the medical professionals can’t tell you exactly how your recovery will go. I am currently recovering from surgery on my esophagus and stomach. If you want the fancy medical term, it was a Nissen fundoplication to fix my gastroesophageal reflux disease (GERD) and hiatal hernia. During the surgery my doctors also discovered that adhesions and scar tissue from my two previous abdominal surgeries had caused my stomach to twist. Basically, my insides needed fixing, even more so than we knew before the surgery. Listening to my hospital playlist right before the surgery. In the weeks leading up to the surgery, I prepared as much as possible. I’m a serial planner: the more prepared I am, the more secure I feel. I knew that I would be on a liquid diet after the surgery, and that it would take time to work up to a full, “normal” diet again. I received several pamphlets before and after the surgery outlining the different diet stages and what would be allowed in each stage. My mom and I made sure to stock up for the clear liquid, full liquid, and soft food phases. I brought my comfiest pajamas and sweats to my mom’s house for the recovery, and we got lots of DVDs from the library. Even though I haven’t had this exact procedure before, I have had several surgeries and more endoscopies than I can count. 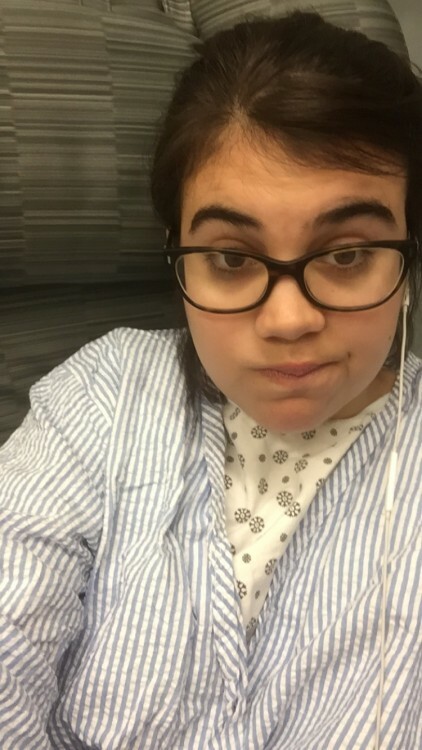 I pretty much knew what to expect in terms of surgical prep, had my headphones ready for the IV placement, and was calm while being put to sleep on the operating table. After waking up in recovery, however, I began to realize that you really can’t plan for everything. My surgeon, for one, hadn’t planned to encounter the extra issues during surgery, but of course he fixed everything and I should be feeling a lot better after my full recovery. 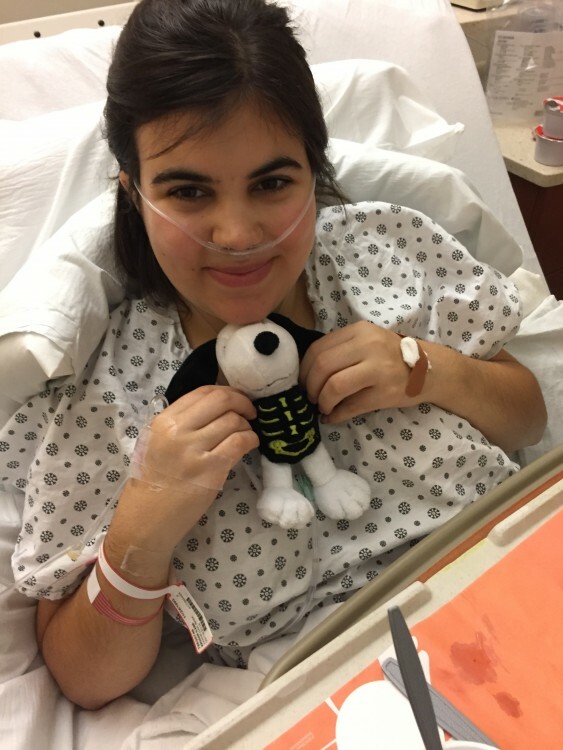 In the hospital post-surgery, oxygen and all, with my new skeleton Snoopy from my best friend. I took off from work, but left the date that I would be coming back in up in the air. I had the full two weeks following the surgery if I needed it, but could come back in the second week if I felt up to it. I had hoped that my doctor would tell me when I’d be able to go back to work, but of course he said that it would depend on how my diet progressed and on how I was feeling. And, of course, how fast my diet progressed would depend on how I was feeling. It was a cycle that would be different for every patient, and he could not predict exactly how it would go for me. Many of the pamphlets told me to “listen to my body” when deciding whether to progress to another stage of the diet. This was a new concept for me, but one that I think is incredibly important when it comes to recovery and illness in general. I normally run my day-to-day life at a high-speed pace. Maybe that comes from living and working in New York City, but I also genuinely like being busy. It’s just how I function. I like having things to do and getting them done. Recovery, of course, is the polar opposite of that. The only things on my list right now are sleep, Netflix, short walks, and whatever my digestive system is allowing me to eat at the moment. Part of listening to my body is accepting that some days are better than others, and not pushing myself too hard on the not-so-good days. Naps are not only acceptable, they are encouraged. My body is telling me that it needs the extra sleep in order to heal itself. The same goes for my diet. A lot of it really is trial and error. While working my way up to soft foods, it’s been stop and go. Mashed potatoes might work one day, and then hurt going down the next day. This means taking a step back and eating the really safe foods, like applesauce. It’s not the easiest diet, and I do wish that I could just jump to being able to eat a full, regular diet, but I’ve accepted that this is part of the recovery process. My body is not ready for all foods, and that’s OK. This whole concept of listening and acceptance includes being at peace with how my body looks right now. It’s OK to be in pajamas all day, with no makeup, and a messy bun. It’s OK that my stomach is currently a mess of incisions, bruises, and surgical glue because that’s just how it is right now. I don’t know exactly when to go back to work, but I am planning to next week. I don’t know when I’ll be able to eat a full diet without pain, and when my body will be able to get me through the day without needing to sleep in the middle. I don’t know when I’ll have that “aha” moment and know that my body is healed and that the surgery was successful. Of course, there probably won’t be one moment when I’ll be able to pinpoint the end of my recovery. My body sends me little signals, letting me know when I feel up to taking a walk outside, or doing a few errands. Part of what makes this recovery process different from my previous ones is this new awareness of my body. Maybe this comes from being a bit older, or maybe it’s just part of my new, self-care focused attitude. I know that the most important thing right now is my recovery, and that the recovery takes place beyond any prescribed amount of time, and that it’s OK if it goes differently than I had initially planned, because I really can’t plan for recovery. I just have to let it happen.